Design Mark Industrial Co., Ltd. 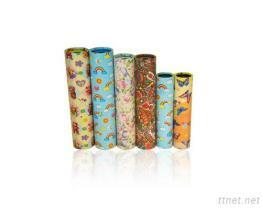 This kaleidoscope is a traditional design made by Design Mark Industry Co., Ltd., famous for their superior high quality kaleidoscopes. The cylinder body is filled with beautiful pictures in a variety of colors. It has a very smooth finish, making the scope feel good to handle. There are falling objects in the end of the tube, making endless fascinating patterns by turning the entire scope as you look through the viewing end.